Radiologic Sciences is the profession whose members have the responsibility to provide skilled technical expertise in Diagnostic X-Ray Departments (Radiologic and Special Imaging Technolo­gist) and Nuclear Medicine Departments (Nuclear Medicine Technologist). The Radiologic Technologist is the professional whose role is to produce radiographs (X-Ray studies) of various body parts and systems, submitting them to the radiologist for diagnostic interpretation. The curriculum includes radiation sciences, radiologic imaging, patient care, quality assurance, management and curriculum studies. Responsibilities include the manipulation of sophisticated equipment including computer reconstructed imaging. Graduates possess the skills to assume positions as radiographers and quality assurance co-ordinators and, with experience, positions as managers or instructors in radiology . Nuclear Medicine Technology involves the use of radioactive materials for diagnostic and therapeutic purposes. 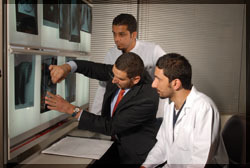 The responsibilities of a Nuclear Medicine Technologist include the administration of radio-pharmaceuticals for organ imaging, the radioactive analysis of biological specimens, the administration of radioactive materials for various therapeutic purposes, and the manipulation of sophisticated equipment such as gamma cameras, computers, and various other radiation detectors. The goal of the program is to produce competent, skilled practitioners who can assume positions in hospitals, clinics, research laboratories, industry and government agencies. To achieve this goal students are enrolled in a course of study that includes basic biological, physical, computer and radiation sciences in addition to clinical training in the teaching hospitals and clinics.